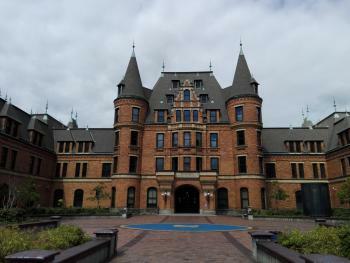 The Stadium District is Tacoma&apos;s historic gem, getting its name from castle-like Stadium High School. Originally built as a luxury hotel in 1891 and reconstructed as a high school in 1906 following a devastating fire, Stadium High School is a historic Tacoma landmark and also the setting for the 1999 feature film 10 Things I Hate About You. The district is itself on the National Register of Historic Places, and is filled with historic homes, tree-lined streets and old-style shops still sporting their original vintage neon signs. Stroll through this historic district and you&apos;ll run into King&apos;s Books, where you&apos;ll find an overwhelming selection of new and used titles, as well as an impressive assortment of indie comic books and graphic novels. Explore the meandering pathways of Wright Park&apos;s expansive 27 acres, including a playground for kids, a sprayground for hot days, bocce courts and the massive WW Seymour Botanical Conservatory. The historic glass conservatory, having been designated a city, state and national historic landmark, is home to exotic tropical plants and seasonal floral displays. Enjoy a throwback burger and shake at the retro Shake Shake Shake (among the best shake shops in the county), go Bavarian with brats, beer and bocce at Rhein Haus Tacoma, or celebrate craft beer with a pint to accompany your gourmet burger at the Hub Tacoma. Or take a walk on the sweeter side at Tease Chocolates, Tacoma&apos;s first bean-to-bar chocolatier. The Stadium District is lined with historic Victorian, Tudor and Colonial homes, many of which are on the National Register of Historic Places, and several of which have been converted into inns and bed-and-breakfasts. The best way to experience history is to live it! Sometimes, it's just easier to find a ready-made itinerary and go with the flow. Here are Travel Tacoma's itineraries that include the Stadium District.